In March 2013, the Prairie Valley School Board submitted the Highway One Corridor Stage One report to the Ministry of Education. Ministry approval is required to move forward with this project. The Stage One report is the result of a comprehensive, stakeholder inclusive planning process led by Stantec Architecture. An analysis involving students, staff, school administrators, the community and several external consultations was completed and led by a project steering committee. Based on public consultation and research, the report outlines a master plan which recommends a second collegiate high school in the Highway One Corridor in additional to modernizing Greenall High School. For a detailed description of how the Board of Education of Prairie Valley School Division arrived at this decision, please read the sections below called "History of the Project" and "Reasons for the Board’s Decision". What is the Highway One Corridor? The Highway One Corridor is the area between the City of Regina limits and the village of McLean, Saskatchewan. There are several communities within this area including Emerald Park, White City, Pilot Butte, Kronau, Edenwold, McLean, St. Joseph’s and the Hamlet of Lajord. The Board of Education began the process of preparing a Stage One report for high school planning in the area in 2010. The Stage One report was completed in February 2013 and submitted to the Ministry of Education. Part of this planning included a survey of area residents to determine their preference for either a new regional high school or two smaller collegiates. The survey showed an almost even split between those favouring a new regional high school and those supporting a new collegiate and the modernization of Greenall High School. 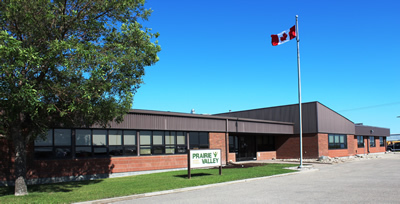 Following a review of the survey information, the Board of Prairie Valley School Division hosted a public engagement/information meeting at Greenall High School. The purpose of the meeting was to provide an opportunity for open discussion around the Highway One Corridor Plan. Given the results and research, the Board of Education for Prairie Valley School Division opted to proceed with two smaller collegiates. Educational Programming: Two smaller collegiate schools will have the ability to function as full service high schools with courses offerings in all subject areas. Extra-Curricular Activities: Two smaller collegiate schools will offer more extra-curricular opportunities for students than one larger school. Demographics and Location: Two smaller collegiate schools will mean each school will have an enrollment of approximately 475 students by 2023 for a total of 950 students in the area. Projections show that 50 per cent of the 950 students will reside North of Highway 1 and the other half will reside South of Highway 1. This natural split favours modernizing Greenall High School for the North side students and building a second school to accommodate South side students. Student Safety: In the short term and given the current highway accessible concerns it is safer to bus students to a school on the same side of Highway 1 as where they live. Community Preference: Survey results indicate that the public is in favour of this option. Utilization of Greenall High School: Two smaller collegiate high schools will mean Prairie Valley School Division will continue to utilize Greenall High School in Balgonie. The condition and functionality of Greenall will be assessed as part of this planning work.